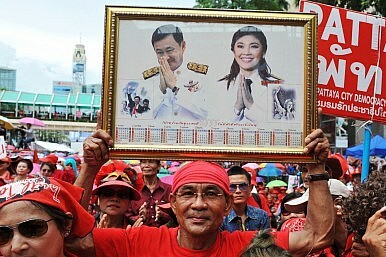 A Red Shirt protester holds a portrait of Thaksin Shinawatra and his sister Yingluck Shinawatra, both former prime ministers. How the Thaksin era ushered in the reign of state capitalism in Thailand. Though former Thai Prime Minister Thaksin Shinawatra, whose family originally came from the northern suburbs of Chiang Mai, has lived in exile for years, in the Chiang Mai area, until the spring of 2014, it was almost as if he never left. Cab drivers displayed his photo on their dashboard right next to Buddha images and pictures of ancient Thai royals. Community radio stations broadcast his speeches from exile, and vendors in nearby villages sold posters of the politician grinning and T-shirts bearing his image. Billboards featuring Thaksin and other local politicians from his party dominated the landscape on the sides of roads. But it was not only Thaksin’s willingness to appear to be listening to poorer, rural Thais that won him office in 2001 and that made his organization the most powerful political party in the country — until a 2014 military coup essentially banned Thai political parties in another attempt to defang Thaksin’s political machine. Thaksin’s state capitalist policies were enormously popular with the majority of poor and working class Thais. Even in Thaksin’s 2000-1 campaign, he was the first Thai politician to really promise a platform of policies to voters, including many types of state intervention in the economy such as new state credits for microenterprises, a new state-funded universal health care scheme, and many others. The platform was credited by many Thai voters and political scientists as the most important reason for his smashing 2001 win. After the 1997 Asian financial crisis, which began in Thailand that summer with the devaluation of the Thai baht and quickly spread across developing Asia, the Democrat Party, ruling Thailand at that time, followed orthodox, neoliberal economic prescriptions to right the economy. The Democrats relied on the help of an International Monetary Fund rescue package and advice from a range of Western consultancies and lenders. The Democrat government tried to force failing Thai banks and companies into bankruptcy, clean up non-performing loans, cut excessive state spending, and reduce state involvement in banks and major companies. It seized the assets of 56 indebted finance companies. It launched a fast-track plan to privatize some 60 state companies and allow foreign investors to take stakes in them, although the unpopularity of the plan led the Democrats to backtrack somewhat. Many of the Democrats’ reforms made sense in a country where poorly-regulated finance companies had run wild, taking huge credit risks with minimal capital reserves, creating an enormous real estate bubble in Bangkok, and bidding up a frothy Thai stock market. And prodded by these reforms, external aid, and the broader recovery in Asia, the Thai economy began to slowly recover in the late 1990s. But unemployment remained stubbornly high. The Democrats’ reform and privatization strategies resulted in the downsizing of many banks and other bloated companies that, though inefficient and sometimes outright criminal, nonetheless had employed large numbers of Thais directly or had indirectly created jobs for construction laborers, food vendors, maids, and other working class Thais. The Democrat Party was portrayed in the 2000-1 election campaign by Thaksin and his allies as uncaring elites, pursuing policies dictated by the West and harmful to ordinary Thais. It was a brutal, and successful, portrayal. Almost immediately after he became prime minister in 2001, Thaksin followed through on his platform promises of far-reaching intervention in the economy. His government launched a series of interventionist economic policies that became known colloquially as “Thaksinonomics.” He overrode the formerly independent Bank of Thailand, the equivalent of the U.S. Federal Reserve, until it went along with his plans to plow large amounts of state money into the economy and to buy up some formerly private companies. Bank governors who did not go along with Thaksin’s ideas were forced out of their jobs, even though the Bank of Thailand, like the Federal Reserve, was supposed to be immune from pressure from elected politicians. Thaksin simultaneously increased state decision-making over what he considered Thailand’s strategic industries, assuming control over many important industries like rubber, aviation, and rice, among others. Under Thaksin, the Thai government created new mechanisms for state loans to microenterprises and cut interest rates to their lowest in the country’s modern history. The low rates and state loans to microenterprises, primarily in poorer parts of Thailand’s north and northeast, unleashed a flood of cheap credit that stimulated consumer demand for new cars, houses, mobile phones, trucks, and other purchases. This use of expansive money supply in itself was hardly unusual; in a way, it could seem like a typical Keynesian response to an economic crisis, little different from the stimulus plan enacted by the Obama administration in its first term or from other Keynesian stimulus plans utilized in Western countries in the wake of the global economic slowdown of 2008-9. Yet Thaksin took the Thai economy in directions far beyond typical Keynesian strategies. In addition to cheap credit, he used the power of his office to push—indeed, force—many Thai banks to offer extremely cheap loans not only to village microenterprises but also to firms in bigger industries he considered strategic. These “strategic” industries included many companies that Thaksin’s government would then take de facto control of by dominating board appointments. He pushed the national electricity provider to lower electricity rates for strategic industries—aviation, oil and gas production, cement making—while taking de facto control of many of these companies as well. Besides taking de facto control of many leading companies, under Thaksin the state took direct control of several of Thailand’s largest and most prominent companies. Openly admiring authoritarian, statist former prime ministers Lee Kuan Yew of Singapore and Mahathir Mohamad of Malaysia, Thaksin also launched a range of what he called new “megaprojects” designed to improve Thailand’s physical infrastructure. Thailand needed better physical infrastructure, but the projects were primarily planned to plow money into leading Thai construction and transportation firms, helping them to consolidate under state direction. Thaksin also pressured Thai producers in certain sectors, like rubber production, to form cartels designed to raise the price of exports on the global market and, simultaneously, increase the power of Southeast Asian governments over commodities markets. Although a 2006 coup removed Thaksin from office and, through post-coup changes in the Thai constitution, attempted to reduce the power of Thaksin’s party, the coup failed to stem Thaksin’s appeal to the rural poor. Thaksin remained influential in exile, and his party quickly morphed into successors with different names but similar policies. A transitional coup-appointed government held elections in 2007, expecting to have diluted the popularity of Thaksin’s statist strategies and helped the Democrats gain office. But Thaksin’s party, with a puppet leader standing in for the exiled Thaksin, dominated the vote again, in part with promises to continue state intervention in the economy. Eventually, Thaksin maneuvered to have his sister, Yingluck Shinawatra, installed as party leader, and she won an overwhelming mandate in the 2011 national elections. Yingluck continued Thaksin’s statist policies of amassing control of companies, offering cheap credit, and expanding social welfare programs. Overall, under Yingluck, Thailand’s public debt continued to balloon, while the idea that the government should take a more active role in directing bank lending, managing companies in key industries, and controlling many other aspects of the economy, became more and more entrenched among top policy-makers. Despite spiraling public debt, many Thai and foreign economists credit Thaksinomics with helping restore Thailand’s economic growth by stimulating consumer demand, focusing on key strategic industries, and effectively using the power of the state to rebuild these industries after the Asian financial crisis. But the verdict on Thaksin’s economic and social policies is hardly unanimous: Many economists and Thai policy analysts argue that, while achieving some goals, Thaksinonomics has left Thailand with a crushing debt burden to be borne by future generations. Some economists further argue that Thaksinomics failed to encourage the kind of innovation that often comes from truly private companies, who are forced to compete with – and usually lose to – Thai national champions in many industries. Thaksin was emblematic of a new type of leader who has emerged in the developing world over the past decade—an elected autocrat. The rise of elected autocrats is one of several reasons why modern state capitalism has emerged and grown over the past two decades. State capitalism, in many of these regressing countries, has been both a cause and an effect of this political backsliding. In some of the cases of political regression, like Egypt or Russia, the countries already had histories of state control of many companies, though the degree of that control varied. Many of these nations went through political and economic reforms at the same time in the post-Cold War period, and, like Thailand, no longer would have qualified as state capitalists by the early 2000s. But an initial generation of elected leaders, like Thaksin, had little commitment to democracy, rolling back democratic institutions and damaging democratic culture. Nearly all of this first generation of elected leaders also deepened state control of the economy as they were chewing up democratic institutions. Sometimes, when the first generations of elected leaders in developing nations failed to embrace democratic institutions, people in these nations embraced undemocratic political answers to the challenge of elected autocrats. In particular, elites and middle classes, who had lost political power at the hands of populist elected autocrats, have turned against democracy. At times, as in Ukraine, Thailand, or Egypt, these elites and urban middle classes have held large, violent protests against elected—if indeed highly flawed—leaders. In some cases, as in Thailand, middle classes and elites have openly called for the armed forces to intervene and end elected democracy and have held demonstrations designed to create pretexts for army interventions. In 2006, the Thai armed forces responded to protest paralyzing Bangkok and calling for military intervention with a coup, and in 2009 army leaders—and, allegedly, the royal palace—helped broker defections in parliament to topple an elected government. In 2014, Thailand’s military, again responding to political unrest precipitated by middle classes protesting in Bangkok, ousted the elected government in a coup, and promised to return the country to a more managed and less democratic type of rule. After the May 2014 coup, the army leader-turned-prime minister, Prayut Chan-o-cha, left open the possibility that Thailand would not hold elections again for some time. The junta suggested that, even when Thailand did return to electoral democracy, it would not resemble electoral democracy as defined by any standard definition. Yet even when middle classes and elites in these countries helped engineer the overthrow of elected autocrats like Thaksin, the authoritarian successor governments rarely jettisoned state control of large segments of the economy. In Thailand, junta head Prayut Chan-o-cha in 2014 continued most of Thaksin and Yingluck’s state capitalist policies, in part because he needed to prevent the poor and lower middle classes, who had been the biggest backers of the deposed prime minister Yingluck, from rising up against army rule. In fact, Prayuth proposed several policies, such as new legislation that would erect higher barriers to foreign investment in the kingdom, that were even more interventionist than those of the Yingluck government. Joshua Kurlantzick is a Senior Fellow for Southeast Asia at the Council on Foreign Relations. This piece is excerpted from his upcoming book, State Capitalism: How the Return of Statism is Transforming the World (Oxford University Press).